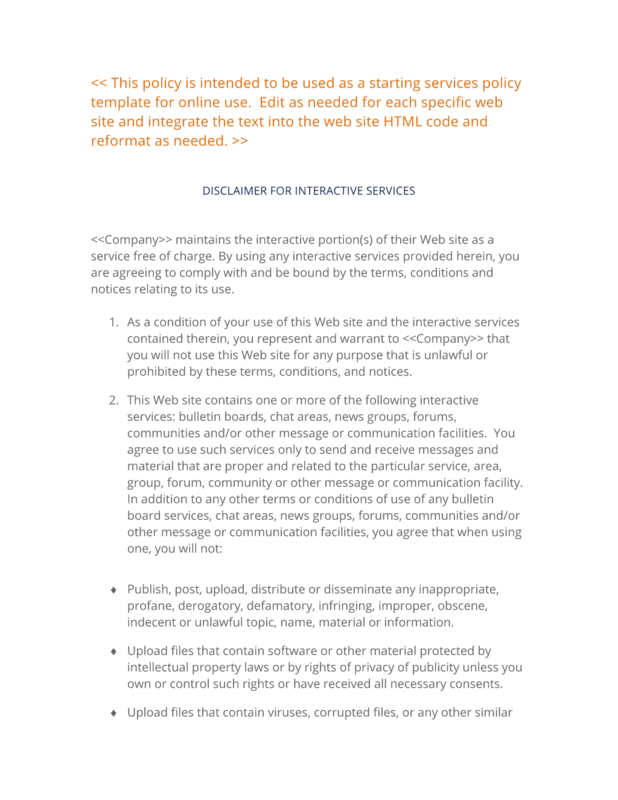 The Disclaimer for Interactive Services agreement is used to protect your on-line services offered to users. This can be edited and incorporated into a web site policy. This should be used for sites that offer interactive services to users in case there is a problem with the site, lost data, access problems, fraudulent postings by 3rd parties, etc. This Disclaimer on Services Agreement Template is included in editable Word format that can be customized in Word or by using the included Wizard software. This policy is intended to be used as a starting services policy template for online use. Edit as needed for each specific web site and integrate the text into the web site HTML code and reformat as needed. Company Name maintains the interactive portion(s) of their Web site as a service free of charge. By using any interactive services provided herein, you are agreeing to comply with and be bound by the terms, conditions and notices relating to its use. As a condition of your use of this Web site and the interactive services contained therein, you represent and warrant to Company Name that you will not use this Web site for any purpose that is unlawful or prohibited by these terms, conditions, and notices. This Web site contains one or more of the following interactive services: bulletin boards, chat areas, news groups, forums, communities and/or other message or communication facilities. You agree to use such services only to send and receive messages and material that are proper and related to the particular service, area, group, forum, community or other message or communication facility. Publish, post, upload, distribute or disseminate any inappropriate, profane, derogatory, defamatory, infringing, improper, obscene, indecent or unlawful topic, name, material or information. Upload files that contain software or other material protected by intellectual property laws or by rights of privacy of publicity unless you own or control such rights or have received all necessary consents. Upload files that contain viruses, corrupted files, or any other similar software or programs that may damage the operation of another's computer. Advertise any goods or services for any commercial purpose. Offer to sell any goods or services for any commercial purpose. Conduct or forward chain letters or pyramid schemes. Download for distribution in any manner any file posted by another user of a forum that you know, or reasonably should know, cannot be legally distributed in such manner. Defame, abuse, harass, stalk, threaten or otherwise violate the legal rights (such as rights of privacy and publicity) of others. Falsify or delete any author attributions, legal or other proper notices, proprietary designations, labels of the origin, source of software or other material contained in a file that is uploaded. Restrict or inhibit any other user from using and enjoying any of the bulletin board services, chat areas, news groups, forums, communities and/or other message or communication facilities. Company Name has no obligation to monitor the bulletin board services, chat areas, news groups, forums, communities and/or other message or communication facilities. However, Company Name reserves the right at all times to disclose any information deemed by Company Name necessary to satisfy any applicable law, regulation, legal process or governmental request, or to edit, refuse to post or to remove any information or materials, in whole or in part. You acknowledge that communications to or with bulletin board services, chat areas, news groups, forums, communities and/or other message or communication facilities are not private communications, therefore others may read your communications without your knowledge. You should always use caution when providing any personal information about yourself or your children. Company Name does not control or endorse the content, messages or information found in any bulletin board services, chat areas, news groups, forums, communities and/or other message or communication facilities and, specifically disclaims any liability with regard to same and any actions resulting from your participation. To the extent that there are moderators, forum managers or hosts, none are authorized Company Name spokespersons, and their views do not necessarily reflect those of Company Name. The information, products, and services included on this Web site may include inaccuracies or typographical errors. Changes are periodically added to the information herein. Company Name may make improvements and/or changes in this Web site at any time. Advice received via this Web site should not be relied upon for personal, legal or financial decisions and you should consult an appropriate professional for specific advice tailored to your situation. Company Name makes no representations about the suitability, reliability, timeliness, and accuracy of the information, products, and services contained on this web site for any purpose. All such information, products, and services are provided "as is" without warranty of any kind. Company Name hereby disclaims all warranties and conditions with regard to the information, products, and services contained on this web site, including all implied warranties and conditions of merchantability, fitness for a particular purpose, title and non-infringement. In no event shall Company Name be liable for any direct, indirect, punitive, incidental, special, consequential damages or any damages whatsoever including, without limitation, damages for loss of use, data or profits, arising out of or in any way connected. With the use or performance of this web site. With the delay or inability to use this web site. With the provision of or failure to provide services. For any information, software, products, services and related graphics obtained through this web site, or otherwise arising out of the use of this web site, whether based on contract, tort, strict liability or otherwise, even if Company Name has been advised of the possibility of damages. This Agreement contains the entire agreement between the parties relating to the subject matter hereof and supersedes any and all prior agreements or understandings, written or oral, between the parties related to the subject matter hereof. No modification of this Agreement shall be valid unless made in writing and signed by both of the parties hereto. This Agreement shall be governed by and construed in accordance with the laws of the State of State. Exclusive jurisdiction and venue shall be in the County County, State Superior Court. This Agreement shall be binding upon all who use Company Name's services, property, and other assets mentioned in this agreement with respect to this Web site and associated content, and it supersedes all prior or contemporaneous communications and proposals, whether electronic, oral or written with respect to this Web site. A printed version of this agreement and of any notice given in electronic form shall be admissible in judicial or administrative proceedings based upon or relating to this agreement to the same extent and subject to the same conditions as other business documents and records originally generated and maintained in printed form. Fictitious names of companies, products, people, characters and/or data mentioned herein are not intended to represent any real individual, company, product or event. Any rights not expressly granted herein are reserved. The complete Disclaimer on Services Agreement Template - with the actual formatting and layout - is available in this Contract Pack.